Thousands of families in Badia were rendered homeless at the peak of torrential rainfall on 18 September 2015 on the orders of the Ojora Chieftaincy Family, and aided by the bulldozers operated by officials of the Lagos State Government. As if the misery of homelessness was not enough, certain persons allegedly acting on the orders of the Ojora Chieftaincy Family invaded Badia community again on Monday, October 12, 2015. The invaders, accompanied by heavily-armed policemen numbering over 30, intimidated, harassed, and maimed the already-distressed evictees who have been displaced and exposed to inclement weather conditions since September 18, 2015. These acts of brutality negate the mutual agreement reached between the Ojora Family and the Badia evictees at the October 7 meeting facilitated by various ministries of the Lagos State Government. The legal counsel to the Ojora chieftaincy family, Mr. Olu Okunniyi contacted Spaces for Change on October 8, 2015, complaining that the evictees have started rebuilding new homes on the demolished land. Our legal team visited Badia the following day, October 9, 2015 and toured the community. We could not substantiate the claims that the evictees were rebuilding on the flattened land. Women, children and the youth continue to live in very precarious conditions, increasing their vulnerability to diseases and social vices. We saw many women with young babies and the local youth sleeping and bathing in the open. Just a few had makeshift tarpaulin shades, supported with woods, as shelter. See photos here. 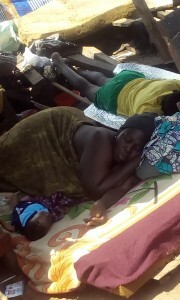 Despite the distressing conditions in which Badia evictees live, it is deeply concerning that these men allegedly acting on the orders of Ojora family still went ahead to cause considerable disruption of community peace and perpetrate further infringements on the evictees’ human rights. One Mr. Kingsley Sunday was whisked away by security forces that accompanied the intruders, and he spent a night in police custody. When Spaces for Change contacted the DPO of the Ijora Police Station – where Mr Kinsgley was held – he informed that the suspect was arrested for taking pictures of policemen on duty. We made it clear to him that it is not a crime under Nigerian law to take photographs of police officers on duty. Despite our appeals, the police DPO declined to release him on bail. Not only that, the Ojora family brought surveyors to carry out a survey on the demolished land. These actions clearly flout the agreements parties mutually reached on October 7. We have written to the legal counsel to the Ojora family to register our objections to the further depletion of the minimal resources of those targeted in the earlier demolition exercises. We have also petitioned the National Human Rights Commission to take necessary steps to ensure these hurtful acts are discontinued forthwith.